In Canada it is often said that hockey is more than just a game. It is who we are. It is our way of life. Author Bruce Dowbiggin even goes as far as to suggest that hockey is perceived to be "a window into our very soul." The award winning sports broadcaster and journalist looks through that window and looks at Canada as seen through the fascinating and sometimes contradictory lens of hockey. His new text The Meaning Of Puck: How Hockey Explains Modern Canada is perhaps the most profound book of the 2008 crop. 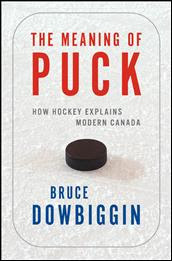 In a collection of essays, Dowbiggin looks at how hockey reflects on so many of the pertinent issues facing Canada, both historically and currently. Such issues as globalization and regionalism, anti-Americanism and racism, violence and military involvement, and hero worship and villains are explored, often eliminating a few Canadian myths along the way. Did I mention anti-Americanism? That one comes up a lot. For example, Dowbiggin looks at how Hockey Night in Canada's insistence on airing Toronto Maple Leafs games every Saturday night mirror's western alienation against southern Ontario's dominance of this country. He looks at how Quebec separatists use hockey as a soap box to advance their political and social causes, often dragging the rest of the country into needless debate. He concludes Canadians use hockey to keep anti-Americanism very much alive and well. And he nicely summarizes that peace loving Canadians craze violence in hockey, even if they blame it on our neighbors to the south. Or how Canadians see themselves in two very contradictory hockey legends, Wayne Gretzky and Don Cherry, even though in reality we are nothing like them. Or at least not like the image we hold them to. The book is very much social commentary with lots of history thrown in to support Dowbiggin's chosen argument. These thoughtful essays are purposely designed to be provocative. Some stances will make you mad, while others you will agree with, perhaps surprisingly. All will make you think, and undoubtedly feel passionate about whichever side of the debate you find yourself on. Dowbiggin is an expert writer, with previous books Money Players: How Hockey’s Greatest Stars Beat the NHL at Its Own Game, Of Ice and Men and The Stick: A History, A Celebration, an Elegy on his resume. This book is almost be the most intelligent hockey book of the 2008. It also tries to be funny at times, which is good. I found the text to be so thorough at times that it exhausted me. It is not meant to be a light book, but that is a good thing. There are far too few books like this in the hockey book marketplace. As good as the book is, it was not a book that I just could not put down. Perhaps it is just my reading style, but I really felt I had to stop after each chapter in order to truly draw the most from each standpoint. It's almost like I felt that the text was trying to be so profound that I had to pause and reflect on what was said in order to give it full justice. Not only is this a very intelligent book, it has the potential to be a very important book of the future. I can see this book being used repeatedly for university papers about Canadian society and history. That is not to suggest this book is written in the highly academic (read boring) format of most university text books. In fact, Bruce Dowbiggin is the perfect author to make these loud claims. And these messages will be heard, because this is going to be one of the most critically acclaimed books of the season. Worst book i have ever read, period! Too wording and showing off with his intellectual style of writing. I really tried to read this book and give it an unbaised read. I just couldn't enjoy reading this book with so much negativity. The author also has a total hate on for Todd Bertuzzi. after about the 3rd chapter of Bertuzzi bashing i began to find his opion more comical Than Don Cherry! Save yourself some time you will never get back in your life and DON'T READ THIS CRAP. I actually really like this book. Thank you for the review. good book! does belabour the bertuzzi thing, but otherwise solid.